Like a lot of other people I'm still logging a significant amount of time, and having a lot of fun, with Overwatch, but let's talk about what else has caught me this month. 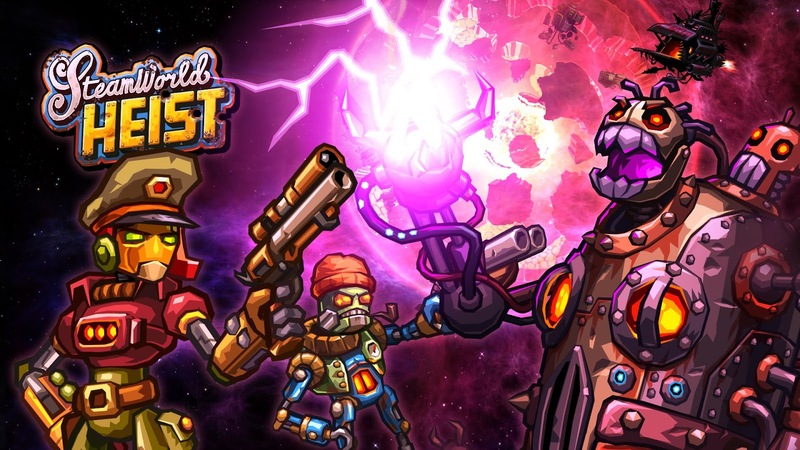 Following up it's original release on 3DS last year, Steamworld Heist came to PC this month. I loved their previous game, Steamworld Dig, so I was excited for this one. Rather than make a sequel to the original title, the team at Swedish outfit Image and Form, opted to instead explore the same world with a totally different style of game. Next up is a game I came back to this month, Rocket League. Their recently added Basketball mode works so well that it was worth the revisit. If the previous addition of an ice hockey mode didn't quite hit the mark, this one perfectly fits the format. It also highlighted the lovely little touches that the developers fit into such a tight, tight, design. The sound design is wonderful, with the 'floorboards' squeaking perfectly, ignoring the fact that I'm pretty sure tires wouldn't sound like that. Rather it's done to sell the emotions of the game. The team at Psyonix do a great job with all those little flourishes that elevate the core game. I like this design approach because the core game loop itself does not need any additional mechanics to be fun. In fact, if they tried to bring in more elements it would probably detract from the immediacy of the game. Thus they instead focus on the visuals and feel of the experience. It's a nice lesson in design restraint.